As a business owner you’ve likely followed news about the EMV liability shift, and wondered whether it’s time your store becomes EMV-compatible and starts accepting credit cards with embedded chips. On a hunt last year for Bowhunter TV, I had a bull elk in my lap for over three minutes, while all the brush in the state of Montana conspired against me as it hid the bull’s vitals. My muscles quivered as I held perfectly still at full draw and the bull glared holes through me and cameraman Larry D. Jones. Professional bowhunter Cameron Hanes (pictured above) shared with Fox News how he got his start, and his views on hunting. Hanes didn’t dream of making a living as a hunter, but he did dream of using his love of the outdoors to write about hunting. His options increased when he discovered bowhunting during his teens. Congratulations to the winners of the 2016 NABA Reno Trade Show Give-A-Way Program drawing that was held this last February! The first nationwide archery survey showed that 18.9 million Americans age 18 and older participated in archery and/or bowhunting in 2012. The Archery Trade Association (ATA) recently released the results of the new survey, which was conducted in the same way as Gallup polls. The findings about archery participation and equipment use are scientifically accurate and not estimates from other data. Don’t Just Fish, BOW Fish! https://www.naba-archery.com/wp-content/uploads/2014/06/Bow-Fishing_1000px.jpeg 500 1000 admin https://www.naba-archery.com/wp-content/uploads/2013/04/NABA_Logo_BLUE.png admin2014-06-04 04:09:352014-06-30 17:38:46Don’t Just Fish, BOW Fish! For much of popular culture, 2012 was the year of the bow. Between the Avengers‘ Hawkeye (Jeremy Renner) and The Hunger Games‘ Katniss Everdeen (Jennifer Lawrence), as well as Brave‘s Merida, archery as a means of self-defense coupled with self-expression retook the public’s imagination. Interest in the sport is up across the board, with membership in the country’s National Governing Body for the Olympic sport alone having doubled since 2011. 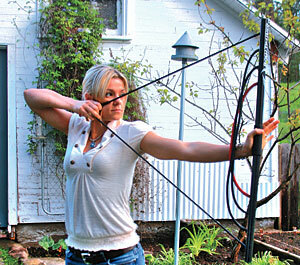 Archery was also the most watched sport during the first week of NBC’s 2012 Olympic Games coverage. But what exactly is behind the public’s recent embrace of the sometimes deadly skill, and how does its real life practice compare to its depiction in popular media? © 2017 National Archery Buyers Association. All Rights Reserved.